Help Centre: What are mutual funds & why invest in them? Get the basics on Mutual Funds & alternatives. Mutual Funds are investment schemes professionally managed by financial experts. Many investors, individuals and entities, invest money in these schemes or funds to generate better returns. These investment schemes could invest in Shares / Stocks(Equity), Government and Corporate Bonds / Securities / Debentures(Fixed Income) or a mixture of the Equity and Fixed Income Securities. Mutual Funds are bought and sold in Units.Mutual Fund units are allocated to investors basis the proportion of their investments and value of these units is tracked as Net Asset Value(NAV) which is daily released by the Fund houses.The Securities and Exchange Board Of India(SEBI) regulates the Mutual Funds industry, and there are around 45 different Mutual Fund houses and more than 12000+ Mutual Fund Schemes. Is there any tax on Mutual Funds? Long term Capital gains tax (if held for more than a year) for equity mutual funds are taxed at 10% for gains withdrawn exceeding ₹1 lakh in a financial year. Gains withdrawn up to ₹1 lakh in a financial year are exempt from Tax. Short Term Capital gains tax (if held for less than a year) on equity mutual funds investments is 15%. Upwardly would provide you Capital gains statement to assist you in your tax computation. What is a lock-in period? Is there a lock in period for my investments? Lock in period is the time during which an investor can not withdraw/redeem his/her investments. Some mutual fund schemes like ELSS/Tax saving funds come with a lock-in period of 3 years as mandated by the government. This essentially means that the investments cannot be redeemed before a period of 3 years from the date of investment in any circumstances. At upwardly, apart from the ELSS/Tax Saving Funds, we do not distribute any funds with lock-in period. In a fund with no lock in period, you can redeem or withdraw your investment at any point in time. Once you redeem these funds, the money would be credited back to your bank account within 1-3 days. What is exit load? How to avoid exit load for my investments? Some Mutual fund schemes have an exit load, and some schemes don’t. The schemes which have an exit load will incur a small charge if they redeem/withdraw their investments before the stipulated time. For example, a mutual fund scheme with an exit load of 0.25% for 3 months, will incur a charge of 0.25% if the investment is withdrawn before 3 months of investment. Please note that the same fund will not incur any charges if the investment is withdrawn/redeemed after a period of 3 months. Upwardly recommends an investment into funds and rebalancing taking into account the exit loads and your investment horizon. So for example, if you want to invest for 6 months, upwardly would suggest a fund which does not have any exit load after 6 months. The exit loads of these funds are mentioned on our website. Upwardly would also calculate the exit load applicable to you once you are redeeming/selling the fund. What are various mutual fund scheme options like growth option, dividend option? Mutual Fund schemes are available in growth and dividend option. Within the dividend option, payout or reinvestment options are available. In the growth option of Mutual fund schemes, profits made by the scheme are invested back into it. This results in the net asset value (NAV) of the scheme rising over time. When the scheme gains, the NAV rises, and in the case of a loss, it goes down. The only option to realise the profit in the growth option is to sell or redeem your investments. The dividend option can re-invest (dividend reinvestment option) or pay out the dividends (dividend payout option) the profits made by the fund. Profits or dividends are distributed to the investor from time to time depending on the profits made. Dividends are declared only when the scheme makes a profit, and it is at the discretion of the fund manager. The dividend is paid from the NAV of the unit. Upwardly advises the right investment strategy for you based on your investment horizon and tax implications. What are open ended, closed ended and interval funds? Open-ended funds are those which can be purchased and sold anytime. Closed-ended funds can be purchased from the fund house only at the time of the new fund offering (NFO) and can be sold only once the period of the closed-ended fund has ended. Interval funds have periodic intervals specified by the funds when they can be purchased and sold. Upwardly only distributes open-ended funds to its customers. Please note that even though the fund may be an open-ended fund the exit loads, if any, would be applicable. Are returns guaranteed on Mutual Funds? Mutual funds are market linked instruments. They invest in stocks, fixed income securities, arbitrage opportunities deemed fit by the Fund manager who is a financial expert. These market linked securities can go up or down in value as per the various macro and micro economic conditions. There is no guarantee of return on Mutual funds. The mutual fund returns can vary from past returns as well. We create balanced and personalised portfolios for you based on your Investment Horizon and Risk Profiles while accounting for the prevailing Market Conditions like Stock Markets performance ( Price to Earning, Price to Book, Dividend Yield), Interest Rates, GDP growth Rates and other important macroeconomic factors. We optimise your portfolio to offer maximum possible expected return for a given level of risk through careful selection of asset classes and mutual funds using our proprietary ranking frameworks. Why are mutual fund investments better than other investment products? Managed by professionals: Financial experts invest in equity and fixed income products invest on your behalf.They are supported by large teams which assist them in analyzing data and dissecting nitty gritty of the markets(macro and micro economic environment, GDP rates, Interest rates and its future outlook, fundamental analysis into each company that they invest or not invest in) which clients as individuals might not be able to do themselves. Better taxation structures: The government of India offers incentives to customers to invest in mutual funds by providing tax structures. So while your fixed deposit returns are completely taxable, Investment in debt mutual funds come with tax indexation benefits (which can lower your taxation burden to almost as low as 2% as opposed to as high as 30% in Fixed deposits). Investments in equity mutual funds have only 10% tax (on gains withdrawn above ₹1 lakh in an year) compared to 30% taxation on FDs. Gains on equity mutual funds withdrawn up to ₹1 lakh in an year are exempt from tax. Better Flexibility: Mutual funds are held in units. So you can always redeem your investment partially while keeping the other investment intact and untouched. This is unlike fixed deposits where you have to fully withdraw your investment and pay pre-mature withdrawal charges on the entire amount. Better liquidity: Open ended mutual funds can be sold anytime. This is unlike investment like Insurance, PPF, NSC, etc. where you have long lock-in periods and large pre-mature withdrawal penalties. Better Diversification: Mutual funds invest in multiple securities. This diversifies the risk for you much better than other investments. Mutual funds that invest in equity (also called stocks or shares) are called Equity Mutual Funds. The objective of Equity Mutual Funds is the Capital appreciation of the investments. The returns of these Equity funds are tied to the stock markets. Various types of Equity Mutual funds are Large Cap, Small/Mid Cap, Flexicap and Sector Funds. Upwardly Smart Tip 1: Equity Mutual funds are best suited for aggressive investors who are looking for medium to long term investment horizon (at least 3 years +). Check out the 3 or 5 Years Annualized returns of the Equity funds on our website to validate the same for yourself. Upwardly Smart Tip 2:There is only 10% capital gains tax on equity mutual funds if the customer stays invested for more than 1 year. Moreover this 10% applies only to gains withdrawn above ₹1 lakh in a financial year. This minimizes impact on most investors. What are Equity-Large Cap Mutual Funds? These funds invest in companies which have very capitalization on stock markets. For examples Infosys technologies Limited, TCS, Reliance Industries Limited etc. Upwardly Smart Tip: The ups and downs in the stock price of these companies are relatively lesser than other Small/Mid Cap or Flexi Cap funds. Recommended period of investment is 3 years plus. Aggressive investors can invest in large cap funds in times of uncertainty in Stock markets. What are Equity-Small/Mid-Cap Mutual Funds? These funds invest in companies which have Small or Mid sized capitalization on stock markets. For examples IndusInd Bank, Blue Dart, Eveready Industries etc. Upwardly Smart Tip: The stock prices of these companies can fluctuate a lot more than the stock price of large cap companies but they can give better returns over a longer term of investment. Recommended period of investment is 5 years plus. What are Equity-Flexi Cap Mutual Funds? These funds have the flexibility to invest in companies irrespective of their size. For example the fund manager can invest in a large cap company like Infosys Ltd as well as Mid Cap company like Blue Dart if he/she believes that the stocks can give better returns. Upwardly Smart Tip: These funds give the flexibility to the fund manager to select the stocks of companies of his choice irrespective of their market capitalization. This in turn can help him/her in generating better returns for the investors. Recommended period of investment is 5 years plus. What are Equity-Sector Mutual Funds? These funds invest in companies of particular industry sectors or business. For example Technology sector funds invest only in technology companies like Infosys Ltd, TCS, HCL Technologies etc. There are different kinds of sector funds like FMCG, Financial Services, Pharma, Energy, Precious metals etc. Upwardly Smart Tip: The returns of these funds can be very cyclical in nature as the returns from these funds are totally dependent on that particular sector doing well and hence the risks of these funds are not diversified enough. Invest in these sector funds only and only if you have a very good understanding of the sector that you are going to invest in. These Mutual Funds invest in various debt / fixed income securities like Central and State government securities, money market securities, commercial papers corporate bonds and corporate debentures. Upwardly Smart Tip 1: Debt Mutual funds are best suited for investors who are risk averse and are looking for more stable and regular returns for their investments. These investors can benefit immensely from the Indexation benefit provided by the government on taxation for Long Term capital gains tax on these funds. Long term Capital Gains tax on Debt funds is 20% with indexation benefits. This benefit can be availed by staying invested in these funds for more than 3 years. These funds are, therefore, a much better investment option than Fixed/Recurring Deposits any day. For example while post tax returns of a 9% yielding FD would have been 6%, post tax returns from a same return generating Debt Mutual Fund would have been 8.8%. A whopping 50% more return than FD. Still investing your money in FDs year after year????? Check out the 3 or 5 Years Annualized post tax returns of the Debt funds on our website to validate the same for yourself. Upwardly Smart Tip 2: Debt Mutual funds can also be a great investment option for investors who, although, have risk taking ability and willingness for Equity Mutual funds but think that the current valuations in the markets are very high and want to invest in equity markets only after a correction. These investors can park their money in Debt Mutual Funds for the interim. This would be still a better option than parking money in Fixed deposits as FDs levy a penalty of 1-2 percent for premature withdrawals. However, debt mutual funds are very liquid and many debt funds do not impose any penalty on withdrawal. So the investor can get much better returns than FD from his Mutual Fund investments. Upwardly Smart Tip 3: Some Debt mutual funds with high and medium term to maturity can give fabulous returns to the customers in a falling interest rate environment. This is because the bond prices move up when interest rates go down and vice versa. What are Debt-Long Term Government Bond Funds? These funds invest primarily in Government Securities of high term to maturity. Since these funds invest in government bonds there is no credit default risk on these funds. Upwardly Smart Tip: These funds valuations are very sensitive to Interest rate movement. If the interest rates go down, the valuations of these funds increase and vice versa. It is best to invest in these funds when interest rates are on a downward trend in the country. These funds can generate fabulous returns for the customers in a falling interest rate scenario. What are Debt-Intermediate Term/Intermediate Term Government Bond Funds? These funds invest Securities of medium term to maturity. The Intermediate term government bond funds only invest in government securities. Upwardly Smart Tip: These funds valuations are less sensitive to Interest rate movement as compared to Long term funds. Investors can invest and stay invested in these funds for a period of 3 years to get Tax indexation benefits. What are Debt-Corporate Credit Funds? These funds invest primarily into corporate debt, deposits and debentures. Upwardly Smart Tip: Investors can look to get better returns in low interest environment by investing in these funds as they hold securities bearing higher interest rates. Investors can invest and stay invested in these funds for a period of 3 years to get Tax indexation benefits. What are Liquid Plus Mutual Funds? Upwardly has designed this category wherein we have selected Debt funds and Liquid Funds which have relatively short terms to Maturity as compared to Long term and Intermediate Term Funds. Liquid Funds, Ultra Short Term Funds and Short Term Funds are part of this Upwardly Category. These funds invest in Government securities, corporate debt, Money Markets etc. Upwardly Smart Tip 1: Investors can invest in these funds if their investment horizon is less than 1 year. These funds beat FDs as they are highly liquid (can be withdrawn any time without any penalties unlike FDs). Upwardly Smart Tip 2: These funds can generate better returns than FDs even in the short term. Upwardly Smart Tip 3: Indexation benefits (explained above for Debt funds) are also applicable to these category for funds and customers can invest in these low risk funds to generate better overall returns for themselves than what they get for their Fixed Deposit investments. Check out the 3 or 5 Years Annualized post tax returns of the Liquid Plus funds on our website to validate the same for yourself. What are Liquid/Money Market Funds? These funds invest in Money market instruments and securities with very short term to maturity (lesser than 90 days). These funds are not impacted too much by interest rate movements and typically give very stable returns to the customers. Upwardly Smart Tip: investors with less than 3 months of investment horizon can invest in these funds. Investors can also keep 10-20% of their investments in these funds to ensure that they do not have to prematurely withdraw their other investments in case of an emergency or urgent money requirement. What are Ultra Short Term Funds? Ultra short term funds invest in fixed income instruments and debt securities which are mostly liquid and have short term maturities. Upwardly Smart Tip: Investors can avoid the interest rate movement risks and generate more returns than Money market instruments by investing in Ultra Short terms funds. Investors with Investment horizon of less than 6 months should invest in these funds. What are Short Term/Short Term Government Bond Funds? These funds invest in fixed income and debt instruments with short term maturity. Government bond funds invest only in Central and State government issued securities. Upwardly Smart Tip: Investors with investment horizon of less than 1 year can invest in these funds and generate better returns than either Liquid or Ultra Short term funds. Investors who are very risk averse and want stable returns can also keep invested for 3 years to gain Indexation benefits for taxation. These funds take advantage of the differential pricing between stocks in the Cash market vis a vis the prices of the same stock’s future in the futures markets. Additionally, these funds park their money in short term maturity debt securities and money market securities and hence have very low risk. Upwardly Smart Tip: these funds can be invested in by customers with investment horizon of less than one year. Since these funds are treated like Equity funds from a taxation standpoint, the short term capital gains tax for these funds are only 15% as opposed to short term capital gains tax of almost 33% tax on debt funds and FDs. 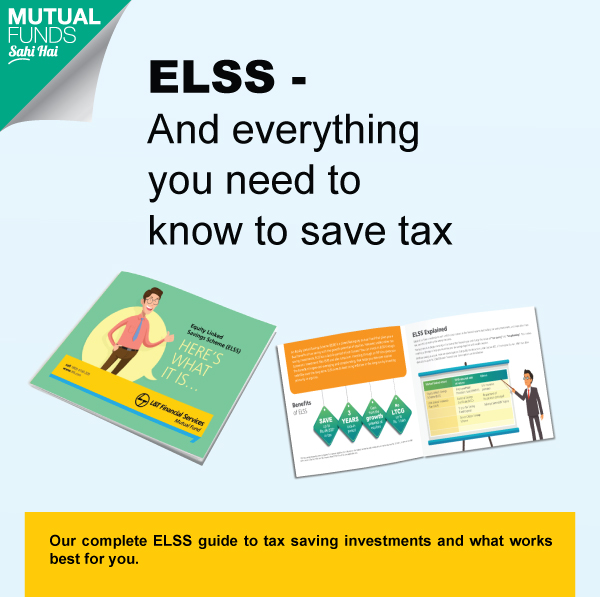 What are Tax Saving Funds or Equity Linked Savings Scheme (ELSS)? These funds are eligible for tax deductions under Section 80 C. These funds invest in stocks and are hence linked to stock markets. These funds have a lock in period of 3 years and hence the investors can not withdraw their money before the 3 year period. Upwardly Smart Tip: These funds provide excellent opportunity to investors for saving taxes while generating better returns than all other tax saving products available in the market right now. Check out the 3 and 5 years returns of these funds on our website and validate for yourself how these are better than any other Tax Saving product e even from a Liquidity or Taxation perspective. These funds invest primarily (above 65%) in stocks and the rest in debt and fixed income securities. These funds have moderate risk as compare to pure Equity funds. Upwardly Smart Tip: These funds are treated like Equity funds for their taxation and hence there is hence there is only 10% tax on capital gains if you hold these funds for more than 1 year. Moreover, gains withdrawn up to ₹1 lakh in a financial year are tax-exempt.Investors can invest in these funds if they are looking for more stable returns than pure equity funds. These funds invest primarily in debt and fixed income securities and the rest money in Stocks. These funds have moderate risk as compare to pure Equity funds. Upwardly Smart Tip: These funds are treated like Debt funds for their taxation and hence there are indexation benefits available if you hold these funds for more than 3 years. Moderate Investors who are looking to add a small kicker to their returns can invest in these funds and hold them for a period of more than 3 years and also get indexation benefits on taxation. ₹500 se toh sirf shuruwaat hai. A plan for every goal. Don't let money go. Let it grow! Long term, short term. Your choice. While you relax, let your money work hard with Mutual Funds. Striking the perfect note between risk and returns. Small beginnings can lead to good returns with Mutual Funds. Aspire for the best, plan with Mutual Funds.